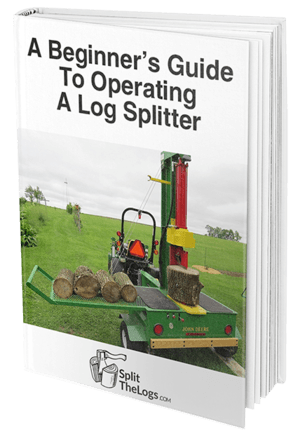 Skid steer log splitters make it easy to harness the power of the splitter and work as efficiently as possible when splitting wood. It’s one of the most popular tools used by contractors because it makes for quick work when splitting large amounts of wood. It’s also used by farmers and is a great investment for homeowners that live on large properties. There are several different styles of skid steer splitters. Horizontal units operate like standard splitters, but they require the user to lift the log onto the beam. Once the log is loaded, it takes just a short period of time to split and you’re able to get a lot done in a short period of time. Upside down splitters are another option. Users place the wood splitte﻿﻿r over the log that needs spitting and use the hydraulics from the cab to split the log. You move the load as opposed to placing the log onto the wood splitter. You’ll never set a foot on the ground – you’ll simply move from log to log working. This is a great way to save wear and tear on your body and still get a lot of work done. There’s also such a thing as a flip-flop splitter. These combine the best of upside down splitters and horizontal log splitters. They work in right side up and upside down positions so you’re able to get a lot of versatility. Changing positions takes just a few minutes so you’re able to take a large group of trunks and logs and split them into a wood pile in as efficient a manner as possible. One of the best things about skid steer log splitters is the energy and time you save when you use them for large projects. You’re able to get more done in less time and, in almost all instances, you save a great deal of physical work. Instead of having to place large logs onto your splitter, skid steer splitters make it possible to work while sitting down. You don’t need to lift or position logs; you simply need to operate the machinery. They aren’t ideal when you’re splitting small logs – the type of work that would be easy with a standard log splitter. If you’re working on a run-of-the-mill job with smaller logs and most of your work is like this, you might be better off with a gas-powered splitter. However, skid steer splitters work for splitting and maneuvering heavy logs. Choosing and investing in a skid steer splitter and skid steer attachments can seem intimidating and it’s important to do a little research before you buy. You’ll need a skid steer loader or front loader before you buy a skid steer splitter so if you don’t have one yet that’s where you begin. The Bobcat skid steers are the best-known company and they were the first to manufacture these machines. They offer several different options, so this is a good place to begin if you’re just getting started. Whether you’re going to opt for a Bobcat skid steer or something else, once you’ve invested in a skid steer loader, you can begin to shop for log splitter attachments. This is what you’ll hook up to the skid steer loader and use for splitting logs. Log splitters can be an expensive investment. They’re worth the cost, but you need to really think about what you need and how you’ll be able to improve your workload by investing in the machinery. Though it might be tempting to opt for the most expensive or most impressive unit available, if this isn’t right for you it’s going to be a waste of money. Think about your usual workload – do you own a lot of property and you need to clear it of trees? Do you have clients relying on you for firewood? Are you using your splitter for your own needs only or does your job require you to split logs? Carefully considering how often you use a log splitter, how much work you do, and what size wood you work with is important before making your final choice. The size of the wood does matter, however, because you’ll need to determine whether you need a 20-ton log splitter or a 30-ton log splitter. Tonnage refers to the amount of force the splitter exerts when splitting wood. Though 30-ton splitters can cost more than 20-ton splitters, the difference in price is often not that much. This tempts many buyers to invest in the more powerful option, but this isn’t right for everyone. Keep in mind more powerful splitters are harder to control so you’ll want to choose the option that’s really best for you – which might be something less powerful. The most important consideration when choosing tonnage for a log splitter is the type of wood you’ll be splitting. If you mostly work with harder woods – cedar or oak – you’ll want the higher tonnage. But if you tend to work with softer woods like spruce or pine, then you’ll get more use from a less powerful splitter. It will also cost you less in fuel and be easier to manage and maintain than the more powerful option. You’ll also need to determine whether you want a horizontal or upside down splitter model. The main consideration here is the size of your crew. Horizontal splitters are similar to traditional splitters, which can make them more user-friendly – especially for the inexperienced – but they make for a two-person job. Upside down splitters can be used by one person and still efficiently get the job done. The operator lowers the splitters over the log, locks it in place, lifting it and pushing it into the blade. There are also different safety considerations with each type of splitter so make sure you understand proper usage before using any type of splitter. There are also some different maintenance issues you’ll need to be aware of when using an upside down splitter versus a horizontal splitter. Therefore, if you want your investment to last make sure you review the needs of the splitter.